Ok, so you may have a favorite Instagram filter, but do you really love it enough to name your kid after it? 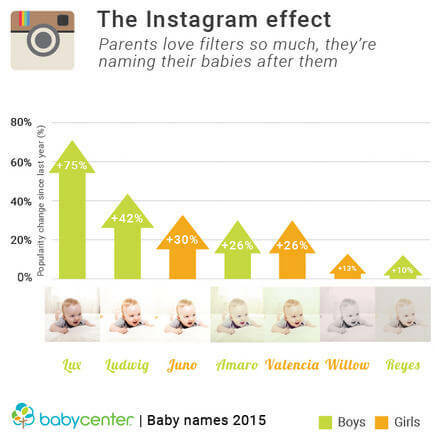 Well, apparently Instagram-filter baby names are gaining popularity among Millennial moms. In its annual top baby name report, BabyCenter’s survey found the Insta-filter name Lux is up 75 percent for baby names this year. Ludwig is up 42 percent. Amarao, Valencia, Reyes, Kelvin, Juno and Willow also make the Insta-baby name list. Why? Well, BabyCenter’s Editor in Chief Linda Murray points to their 2015 Mobile Mom Report, which found 75 percent of moms use their mobile phones to share photos of their kids. She links the trend to the emotional connection Millennials have with technology. “Photo-sharing is a daily and emotional part of Millennials’ lives, and those two ingredients can trigger love for a name,” said Murray. Royal Names—A Freudian Desire for Fame? While Murray says this is the first time they’ve seen technology break though as a naming trend, they weren’t exactly surprised to see another hot trend–royal names. And no, I don’t mean William, Kate, George or Charlotte, I mean naming your kid “Royalty”! 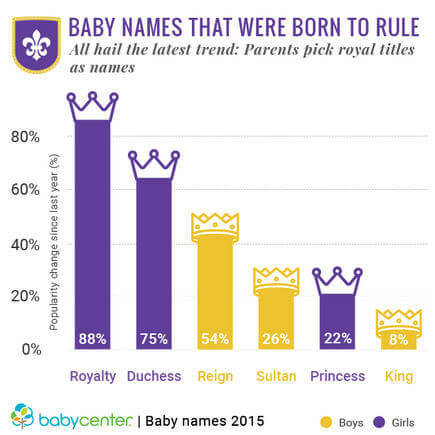 The baby name Royalty is up nearly 90 percent, Duchess is up 75 percent and Princess is up 22 percent. So what’s behind the growing trend of names like Princess or Royalty? Well, according to Murray, it may be a Millennial desire for their kids to grow up to be celebrities. BabyCenter notes Kourtney Kardashian’s son is named Reign, and Chris Brown’s daughter is named Royalty. Editors point out that popular TV shows like The Royals and Reign may also have had an influence. Another hot trend is actually a new twist on an old one—gender neutral names. “We used to see an inverse relationship with gender neutral names. If a name was rising on the girls’ list it was declining on the boys’ list,” explained Murray. 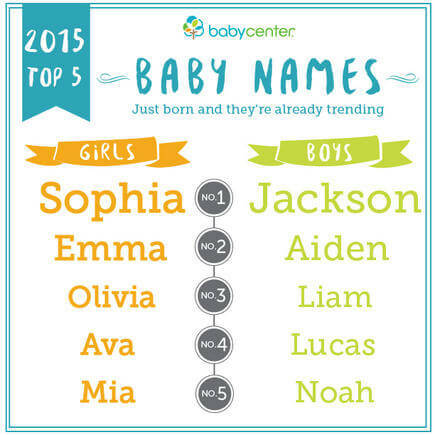 But this year, for the first time, BabyCenter found many gender neutral names are rising on both lists. Names like Wyatt, Lincoln, Karter, Maxwell and Carson all increased in popularity for both boys and girls. Murray attributes this to a variety of factors, but notes that the last time gender neutral names were popular was back in the ’80s. Since Millennial parents are products of the ’80s, she thinks it makes sense that the trend is back. She notes that Mark Zuckerberg just named his daughter Max, and Murray believes parents who choose gender neutral names encourage their kids to break down barriers and defy stereotypes. While the cool Insta-filter, royal and gender-neutral names are on the rise, none of them actually made the top 10 list. But I bet you know a bunch of kids whose names did. I have nieces with 3 of the top 5 names, and I almost named my daughter one of the others—Olivia. You know what prompted my last minute name change? A wall decal. 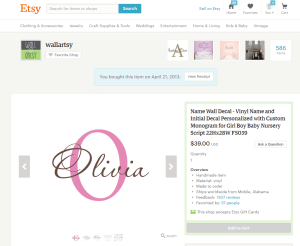 Much like the Insta-Royal-Gender-Neutral parents, I wanted my little girl to be unique, and while shopping for wall decals on Etsy, I noticed that “Olivia” was the sample name. Unfortunately it wasn’t until my Olivia decal arrived that it occurred to me the sample name was a likely indicator that everyone else was naming their kids Olivia too. Fast forward two years and my kid has a different name, but I still have that wall decal rolled up behind my desk. Anyone know an Olivia who might want it? Seriously, it’s yours for free!